Introducing the capability to manually create a conversion. There are a few reasons why a conversion may not be tracked within the platform, such as a user switching between devices before making the purchase. When a customer reports that there has been a conversion that warrants reward attribution, search for the purchase and trigger the conversion through the platform. 6. Select the associated widget from the drop-down menu for reward attribution. Note the reward summary under this menu, dynamic based on selection, that will assist in a quick check that proper widget and reward are selected. Note: Option to override fraud checks, reward criteria, and days to delay coming soon as enhancement to this tool. 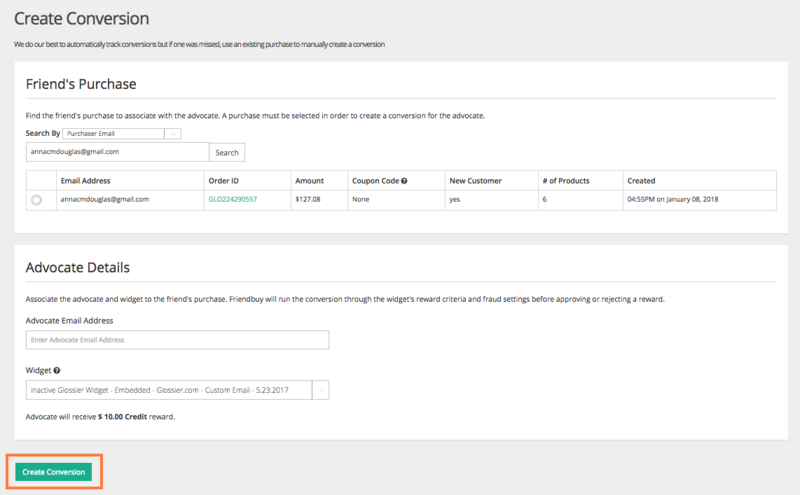 cross-reference expiring coupon codes in Friendbuy with coupon codes in your eCommerce platform, or to utilize available coupon codes in a marketing campaign.